Scientists working in the dense jungles of Indonesia have "rediscovered" a large, gray monkey so rare it was believed by many to be extinct. They were all the more baffled to find the Miller's Grizzled Langur — its black face framed by a fluffy, Dracula-esque white collar — in an area well outside its previously recorded home range. The team set up camera traps in the Wehea Forest on the eastern tip of Borneo island in June, hoping to captures images of clouded leopards, orangutans and other wildlife known to congregate at several mineral salt licks. The pictures that came back caught them all by surprise: groups of monkeys none had ever seen. With virtually no photographs of the grizzled langurs in existence, it at first was a challenge to confirm their suspicions, said Brent Loken, a Ph.D. student at Simon Fraser University in Canada, and one of the lead researchers. The only images out there were museum sketches. "We were all pretty ecstatic, the fact that, wow, this monkey still lives, and also that it's in Wehea," said Loken. The monkey, which has hooded eyes and a pinkish nose and lips, once roamed the northeastern part of Borneo, as well as the islands of Sumatra and Java and the Thai-Malay peninsula. But concerns were voiced several years ago that they may be extinct. Forests where the monkeys once lived had been destroyed by fires, human encroachment and conversion of land for agriculture and mining and an extensive field survey in 2005 turned up empty. "For me the discovery of this monkey is representative of so many species in Indonesia," Loken told The Associated Press by telephone. "There are so many animals we know so little about and their home ranges are disappearing so quickly," he said. "It feels like a lot of these animals are going to quickly enter extinction." The next step will be returning to the 90,000 acre (38,000 hectare) forest to try to find out how many grizzly langurs there are, according to the team of local and international scientists, who published their findings in the American Journal of Primatology on Friday. They appear in more than 4,000 images captured over a two-month period, said Loken, but it's possible one or two families kept returning. "We are trying to find out all we can," he said. "But it really feels like a race against time." Experts not involved in the study were hugely encouraged. "It's indeed a highly enigmatic species," said Erik Meijaard, a conservation scientist who spent more than eight years doing field research in the area. In the past they were hunted to near extinction for their meat and bezoar "stones," he said, which can, on occasion, be found in their guts. Bezoars, as Harry Potter fans know from lectures given by Prof. Snape to first year students, are believed by some to neutralize poison. 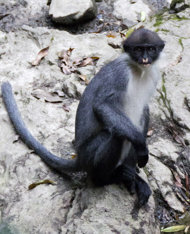 Meijaard said the animal has long been considered a subspecies of the Hose's Leaf Monkey, which also occurs on the Malaysian side of Borneo, but it now looks like that may not be the case. "We think it might actually be a distinct species," he said, "which would make the Wehea discovery even more important."